These umbrellas are classics and this is not coincidence. Whether it is a suave hollywood hero confidently walking down the street or Charlie Chaplin’s go to prop; these are a time honoured product. This of course means that while umbrellas have unbelievable reach to potential target audiences through their mere practicality and visibility, they are also a fashion accessory. The practicality of promotional umbrellas may as well allow the user to associate its function (protection, present and visible) with your very company; subconsciously or not. These products are part of our everyday lives and the association is forged with every use, not to mention the impression we have of these classics through hollywood references; it is chic. This means, that your promotional product will fulfil a marketing role every single rainy day - effortless on your part. The umbrella, equipped with attractive colours will ensure your logo and slogan will leave an impression through the long term and allow you to reach an audience that extends to a radius you have never even circled. If you live in the United Kingdom, an island that sees floods at regular intervals you realise that the concept of a ‘rainy season’ loses its meaning and beach weather is practically unheard of. While we might prefer the sunshine, we are able to turn the not-so-great weather into something even better; a promotional opportunity in its truest business sense. Business is all about perspective and innovation and the vision of casual and automatic marketing is a game changer, particularly considering the ease of access to quality items and attractive branding. 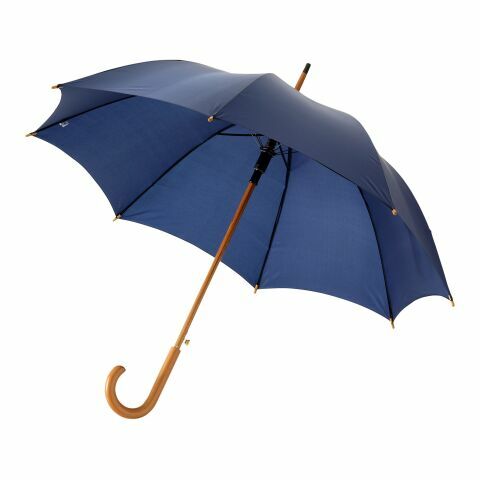 Such branding is available on numerous products on our online store; variations of the umbrella include golf, parasols and further accessories such as keyrings and advertising mugs. The backbone of any company is the engagement of customers. This simple fact allows you to take the right steps in optimising your reach towards any audience and start building on and leaving behind a corporate awareness to both service-users and employees alike; the effect is automatic. Adding a marketing tool by going about your day to day just like you usually would is nothing short of visionary. So why the cane umbrella? Our collection of printed cane umbrellas shine with their elegant look and colour. The large canopy offers enough space for two people and can protect from rain, snow or hail. Because of the high quality production, the umbrellas are not only lightweight but also very durable which makes for a long-term usage. We compiled the most popular version in our online store for you. The range extends from versions with a straight or tilted wooden handle to versions with fibreglass ribs or aluminium ribs. As always we offer a range of colours, so that your promotional umbrella will become the most prominent out of the set. Advertisements have to be eye-catching and the umbrella is. However not all products can be considered the right promotional products. In times of high advertising pressure, it is important to come forward and not be part of the same old story and umbrellas open the doors to innovation. This is because printed umbrellas unite two important aspects: they have high functionality in terms of a wide range of users as well as the frequency of use while athey also offer a large advertising space befitting for your company design. Appeal to the most basic and prominent of senses; vision. The use of these umbrellas will acquire your business new customers as well as employee incentives. In cross industry cases, umbrellas can be used at exhibitions, concerts or at the point of sale. It is most certainly a high-quality gift which touches on your fashion sense and may as well be the addition that will complete your outfit to perfection. We have become desensitised to advertisement in its classical forms; tv adverts, posters and leaflets. Consider how many billboards and screens you pass without ever taking in the item or service promoted. This is because it is far too external; it is by using, finding practical purpose and regular visual contact through branded products that a message sinks in far more effectively. And so the canopy of an umbrella, made out of nylon or polyester, is perfect to print a corporate design on and visible on the regular. The preferred printing method is usually a silkscreen or transfer print. Depending on the chosen base colour, your design will be either subtle in nature or more concise. For more options do check out our printed golf umbrellas, promotional pocket umbrellas and range of options available for purposes of customisation.